The Italian company Certabo manufactures several beautiful electronic boards. 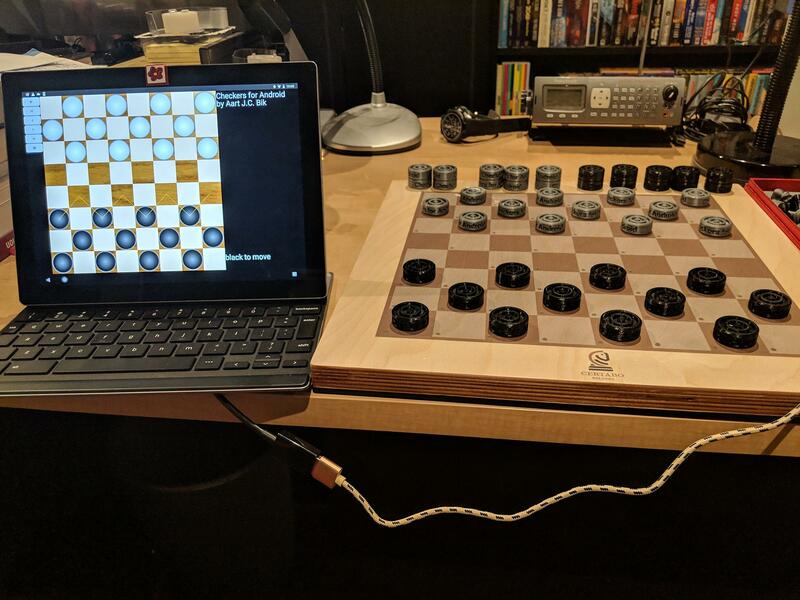 The intended use is mostly chess, but the board is also suitable for 8x8 checkers. 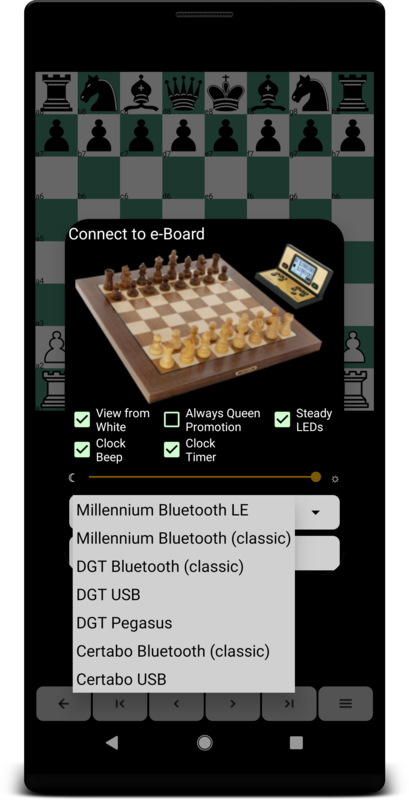 Since v5.9, Chess for Android can connect to a Certabo chessboard over USB. 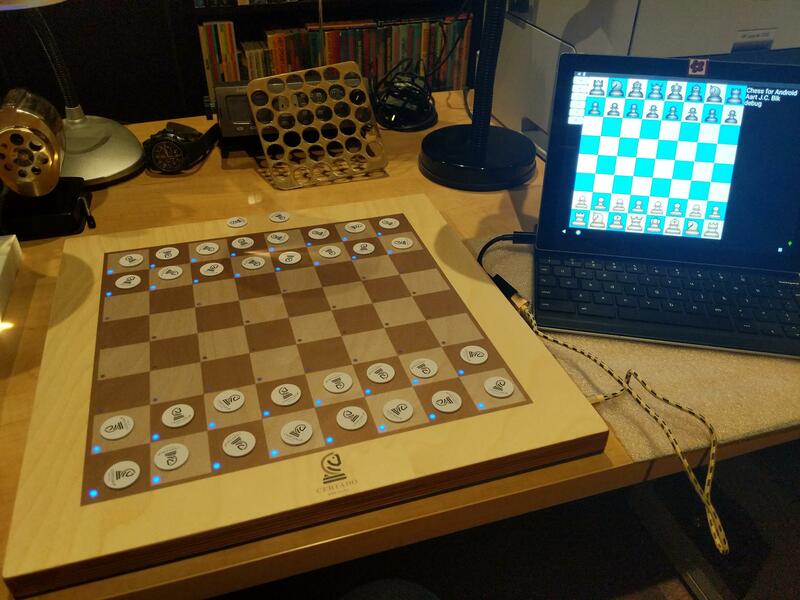 Support in Checkers for Android is coming! Long press the notation window to open the extended menu. Then select "Connect to EBoard", pick the Certabo USB, choose an initial orientation (white at bottom when checked) and LED function (enabled when checked), press "CONNECT", and select the right connected device. Unlike other electronic boards, Certabo boards do not necessarily come with their own, fixed pieces. Instead, a set of 34 identifying chips is provided, which can be attached to the bottom of pieces in any set (for chess, 32 pieces and 2 additional queens for promotion; for checkers, 24 regular checkers and 10 kings for promotion). A fun project is to use 3D printed sets, as shown the pictures and video on this page (courtesy Gerard Harbers for making the sets!). The STL files for the checkers pieces are made availabe below. This implies that the GUI must first match unknown chips with the right pieces. Chess and Checkers for Android do this by assigning pieces on the GUI board to unknown detected chips on the electronic board. Thus, the easiest way to get a match is by starting a new game on the GUI with the pieces on the electronic board in the opening position. However, you can start with any position on the GUI and place the right pieces on the electronic board accordingly. The LEDs are used to indicate remaining mismatches. If a (minor) promotion happens during the game, any piece with a still unidentified chip will get the proper assignment. Of course, an already identified piece that matches the promotion can be used as well if that piece was captured earlier in the game. At any time, disconnecting/reconnecting will restart the identification process. 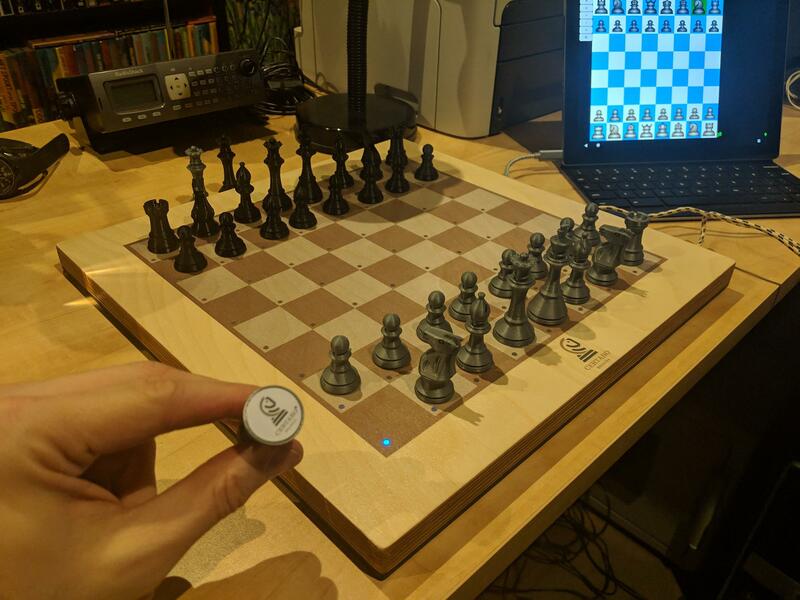 Setting up the start position with white on either the bottom or top of the electronic board will start a new game with Chess or Checkers for Android using that orientation. Move a piece to make a move, and follow the LEDs or GUI to make the computer's response. To capture, remove the opponent's piece from the board. For chess, to castle, move the king first two squares to the left or right. To capture en-passant, move your own pawn first before removing the opponent's pawn. To promote, move your own pawn to the last rank, select the promotion piece in Chess for Android, and then replace the pawn with that piece on the electronic board (a piece with a previously unseen chip is automaticaly identified correctly). For checkers, pieces always promote into a king. To set up a position, long press the notation window, pick "Position Setup", after which Chess for Android continuously syncs its internal board with the electronic board. After pressing "OK", the game can proceed from the given position (if valid). When LEDs are enabled in the dialog, the computer move is indicated with LEDs. Similarly, if an illegal move is made, or the electronic board is somehow out-of-sync with the GUI, the LEDs are used to indicate the difference. Correct all differences before proceeding with the game. Likewise, if the game navigation buttons are used to go backward or forward in a game, the LEDs indicate how to resolve differences. Without LEDs, the GUI appears unresponsive when an illegal move is made or the electronic and GUI's boards are out-of-sync. In such cases, carefully match the position on the electronic board with the GUI's board before proceeding, or use the position setup to correct the difference (this may break the game flow, however). 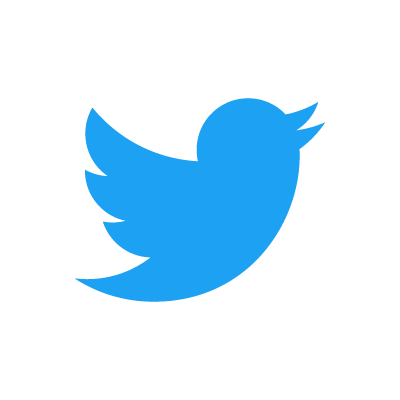 Other features, including playing against third party chess engines, are explained in the Chess and Checkers for Android Manuals and the instructional videos below.